Could Nokia be planning MWC 2013 reveal for its rumoured tablet? Is Nokia making a Windows 8 tablet? 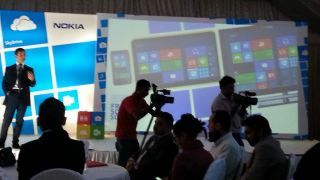 At Nokia's Pakistan launch of the Lumia 620, the company showed an image of an array of products, one of which was suspiciously tablet-sized. Well now Nokia has gone on record as saying that tablet isn't an official product, rather it was just for illustrative purposes. However, Nokia hasn't ruled out making a tablet, so the rumours of its existence could yet be substantiated. We might even seen one at MWC 2013 the week after next. "That's not a leak," a Nokia spokesperson told My Nokia Blog. "That is a picture that simply shows WP UI alongside Win8 Tablet UI alongside Xbox UI. They are not Nokia specific products." The tablet in question showed the Windows 8 start screen with live tiles. It also had the same rounded corners and the bright yellow casing that's typical of Nokia's Windows Phone 8 handsets. We've heard plenty of rumours previously concerning a possible Nokia tablet. Whispers from the supply chain said the Finnish firm was gearing up to launch one this month, while CEO Stephen Elop recently told reporters in Sydney a tablet was something "we are clearly looking at very closely". Nokia's design chief also seemed to confirm a tablet was in the works. We'll be on hand at Mobile World Congress to bring you all the news as it happens.